Offering you the most for your money. This is the best RV Park in West Texas! It’s extremely clean and the management is so friendly! They have a laundromat on site that is very nice and well maintained and it’s free! Did I also mention free cable and free electric! And the cable has several channels! Can’t beat that deal! This is my go to RV park every time I visit West Texas! You won’t find a better deal than this one! Free DVR with HD, 200+ Channels! Free Movie Channels – HBO, Starz, Showtime Movie Channel, Cinemax, Encore, etc. Unmatched offerings you won’t find at other Midland TX RV parks. This area is super clean and very safe. This park has the best deals! There is FREE wifi, FREE cable, which includes ALL the movie channels and pretty much every channel you could ever want to watch! The wifi is also very fast because you have your own modem so your wifi is not shared with anyone! Just like in a house!! Best ever!! Also, electric is FREE!! Also, there is a FREE laundromat that is very new and very clean!! You won’t find a better deal in West Texas!! This is by far the best place to stay!! 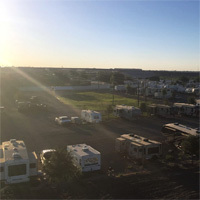 Our RV Park is clean, cozy and convenient! conveniently located on business 20 and less than a quarter mile from Interstate 20 and Loop 250. We’ve been here for 2 years and love it. Very clean, quiet, and well maintained. Owners and managers are always working to improve the park. Best bang for your buck at the best RV Park in Midland.